The guillotine is something that normally seems quite removed from my American existence and from the era we live in. But living in France really makes the guillotine come alive, so to speak. First of all, my friend lives in an apartment around a courtyard in which Dr. Guillotine is supposed to have worked on and perfected his "humane" execution device. Then, once during a class discussion of ancestors, one of the Pippa's friends tells the class that her however-many-times-great grandfather was guillotined during the French revolution -- obviously after he had children. Living near Hotel de Ville (where many of the 2780 people condemned to death in Paris were guillotined during the French Revolution), the Conciergerie (where Marie Antoinette was imprisoned while waiting to be beheaded), and the historical center of Paris, it's inevitable that we run across guillotine references every now and then. 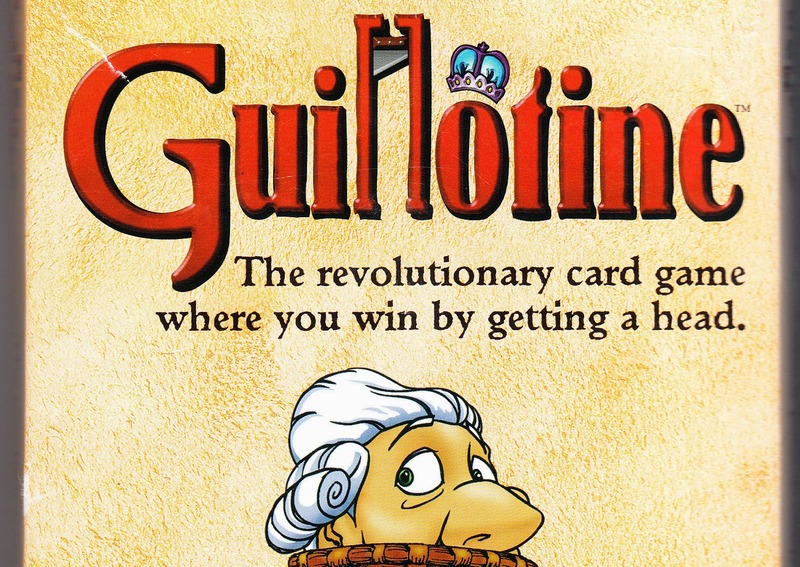 And that's besides the Guillotine game we have and enjoy playing. 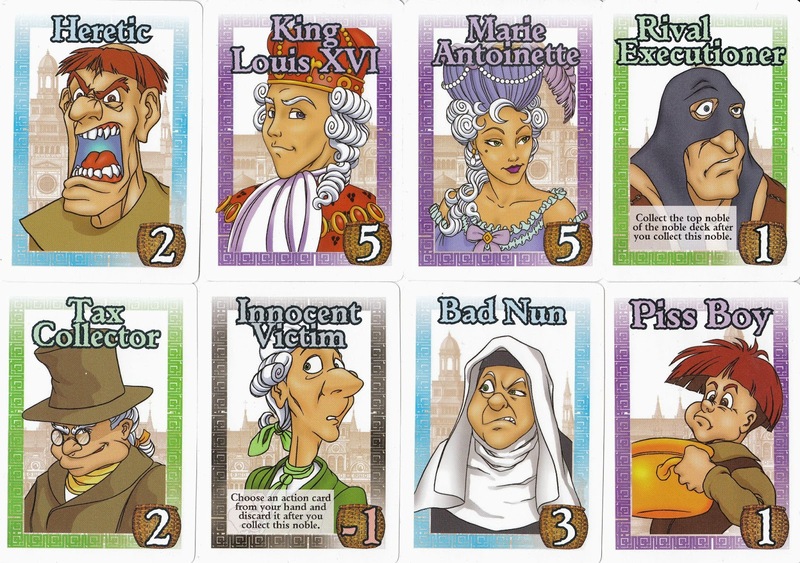 You get the most points for the heads of King Louis XVI and Marie Antoinette. But it was all such a long time ago, it's ancient history. N'est-ce pas? Not quite. A: When was the last time the guillotine was used? You probably guessed the late 1700s, after the Revolution, or the mid 1800s. I don't know: Maybe you wanted to be extreme and guessed sometime in the early 1900s. The last person to be executed by guillotine was Hamida Djandoubi, in France, on September 10......1977. No, that's not a typo, and it is indeed during my lifetime. That's crazy. Use of the guillotine wasn't actually abolished officially, along with capital punishment in France, until 1981, during Francois Mitterand's presidency. It's a grotesque fact, but a great bit of trivia if you ever want to floor people at a pub quizz or a cocktail party. Raclette Poivrée is yet another of the many Raclette cheeses I try this past Raclette season. 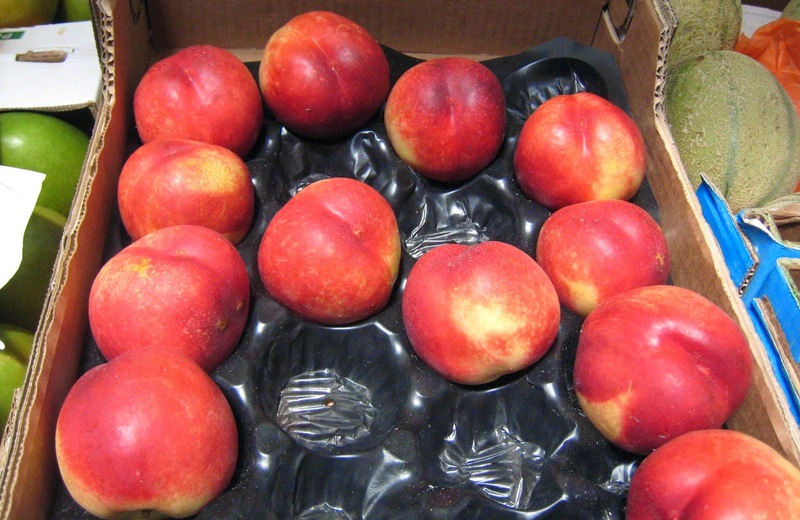 This one, as the name and photo suggest, is peppered. With little grains of black pepper throughout, I assumed it would actually be spicier and pepperier, but in fact it's a mildly black pepper flavor and lovely over the usual Raclette potatoes. Though most people associate Raclette with the mountains, the Jura, and the Alps, this Raclette, like so many others I buy at the Pascal Bellevaire store, comes from the Aquitaine region, in Southwestern France, by the Atlantic coast and the Pyrénées mountains. It's a raw cows' milk cheese and perfectly edible raw, but its true purpose in life is to get melted. You see that nifty cutter that the cheesemonger is using to slice off my sliver of cheese? I buy so much cheese from this particular shop on this particular day (they know about my project, and also know that I want to photograph at home the big chunks I'm buying before they get sliced) that they slip the slicer into my bag for free. It's a thoughtful gesture, but it turns out that it's not as easy to slice neatly as my cheesemonger makes it out to be. My Raclette slices are, to put it mildly, a little mangled. However, it's all just going to be melted, poured over meat and potatoes, and mashed up in our mouths, anyway, so nobody really minds. In any event, that explains why I choose the Raclette Poivrée in honor of French slicing devices -- whether used for good (cheese) or evil (chopping off people's heads). When will my French be perfect? When chickens have teeth. That's "when pigs fly" to us English speakers, but I guess chickens won't have teeth any sooner. Often, it's the idioms that get me, because you just can't translate them literally. But one thing I do know about French expressions is that if you don't know how to say it, try it starring a cat. Pippa's excited because we are coming onto, second only to Christmas, the greatest season of all: Melon Season. The first of the melons -- what an English speaker would call cantaloupes -- have started appearing in the markets. Organic ones are still expensive and inconsistent, though the non-organic ones imported from Morocco are heaven itself (I simply couldn't wait for the organic price to go down and quality to go up). Even better yet, once melon season hits, our local little ice-cream shop -- world-famous tourist destination Berthillon -- starts producing the seasonal melon flavor. Ever the optimist (or just desperate for melon ice cream), Pippa starts scouring the shops in April, despite the fact that it has never appeared until May. Why not melon ice cream in the winter (they have other summer flavors like wild strawberry or blackberry)? It's like wearing white after Labor Day; it simply is not done. I have to say that American cantaloupe has nothing on French melon. The French version seems to have a much more intense, rich, full flavor. When it's juicy and sweet, it's an unbeatable dessert, despite the fact that the French oddly consider it to be an aperitif. They will eat no other fruits before a meal, but rather save them all for dessert, except for melon. This is served before a meal, with or without ham slivers. Perhaps the only thing Pippa loves more than melon at home, melon in restaurants, and fresh melon Berthillon ice cream (over 60% pure fruit, and the rest only water, sugar, and lemon) is when the first course of the school lunch, normally reserved for salads and vegetables, is melon. Fleurs d'Anjous is an organic, artisanal cheese made from the pasteurized milk of Jersey cows. The cheese is made in Anjou, the historic name for a department/province-sized area, controlled by the local Count or Duke, at various points, just below Normandie and next to Bretagne. This explains the proximity to Jersey cows, just off the shore of the coast there (and yet, surprisingly, a very inconvenient and expensive place to get to for a vacation. Believe me, I've tried). It's a sticky, stinky orange-rind cheese, with a creamy but firm interior. The cheese, which is named after the flowers of Anjou, does indeed have an array of complex flavors -- floral and sweet along with foot fungus -- that is (probably, mercifully) minimized by the pasteurization. The cheese is aged 21 days, during which it develops its full flavors that also are said to include hazelnuts. I don't get hazelnuts, but the experts do -- the ones who gave it a gold medal at the World Jersey Cheese Awards. Since the French Revolution, most of this area has been known as the Maine-et-Loire department, but there's still a nostalgic, poetic association with the name, for both this cheese and, of course, d'Anjou pears, which are pears...d'Anjou. Finally, after all this time, you've had the name explained! So by name, it's not a melon cheese, it's more of a pear cheese. While we love the pears that appear for the last few months of winter, we all cheer when it's finally time to say good-bye to pears and hello to melons. 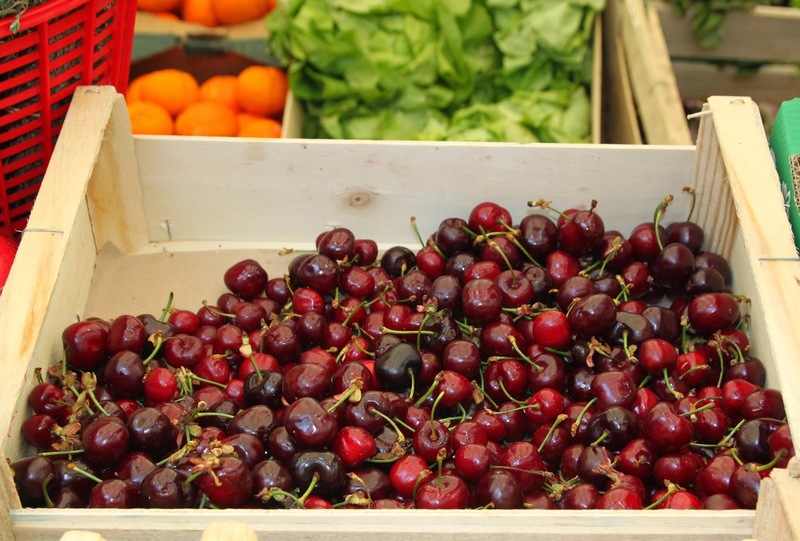 Plus, it means that all the summer berries and stone fruits are just a few sunny weeks away. By looks, on the other hand -- all round and cantaloupe-orange, the Fleurs d'Anjou fromage is more melon than pear. Toto, I don't think we're in Paris anymore. Gymnastics competition season means many trips out of the city to various gyms in Ile-de-France, and carpooling in our friend's car, it's pretty easy to see the moment when we cross the city borders. The street signs change, and one of the kids even notices the pedestrian crossing signal looks different. But as we get into the real suburbs of Paris, it's the houses that give it away. Made of meulière, it's a local sedimentary (and also siliceous -- but I must admit I don't what that means in English or French) rock that was used till the 1880s for mill wheels to grind grain. In the Parisian basin, there are two levels of meulières, one from the age Sannoisin (called the meulière de Brie), and the other the Chattien age (meulière de Montmorency). I know most of this because I've looked it up; and I only know it's meulière in the first place because I'm walking around the town, waiting for the girls to finish their warm up before the competition, with my friend David, an architecture buff. The rocks were used to make blocks for houses especially during the late 19th century and up till the 1930s, designed by architects for vacation homes for rich Parisians back when this was still rolling countryside and not sprawling suburb. You see these houses especially in Ile-de-France, surrounding Paris, in Val d'Oise, les Yvelines, le Val-de-Marne, les Hauts de Seine, and Seine-Saint-Denis. Meule Vendéen is a pasteurized cows' milk cheese from, obviously, the Vendée region on the West Coast of France. It's a big wheel of a cheese, which thankfully comes in small slices at the grocery store, and even more thankfully, comes with some sample chunks so I don't actually have to buy any. It's only sold in the Vendee -- not a big export cheese -- and I think after tasting it I can tell you why: It's just not very interesting. It's not bad, mind you: the usual hard cheese texture of breakable but still a bit creamy. The crust is grayish-blackish-reddish and bumpy and I'm sure that a big wheel of it looks every bit like a millstone (meule) it's named after. It has a very mellow flavor typical of many pasteurized cheeses -- muted and slightly sweet-salty. It's obvious to see that the words "Meule" and meuliere are related, since a Meule is big, hard, rock-like wheel of cheese and also the name for the brick formed from the meulière stone and also the name for a millstone make from the meulière stone. One of the descriptions I read about meulière describes the stone as cavernous and riddled with holes, "like an Emmental." It's nice when my sources start doing my cheese connections for me. So this Meule is not only a slice off of a Meule, which looks like a meule, it's also riddled with holes, like an Emmental, or like meulière stone. Now if only it came from the Ile-de-France region, it would be perfect, but while Ile-de-France is known for meulière and meule houses, it's not a region that makes cheese Meules. When a French person asks me the seemingly simple question, "Where in the United States are you from?," I realize just how American I really am. Because it's such a simple question, but I have such a complicated answer -- an answer that is so foreign to the French. Where am I from? Well, I was born in Detroit, but moved to Rochester, NY when I was two and lived there till I was 12. Then I did most of junior high and high school in Minneapolis, MN, and when I went off to Princeton, my parents moved to Kalamazoo, MI. Yes! Kalamazoo is a real place, and real people actually have lived there, though my parents don't live there anymore and have been in the Boston area for quite a while now. After Princeton, I spent a year in Taiwan, about 6 years in Japan, a year in the Philippines, a year in Hawaii, and finally moved to San Francisco, where I lived for 14 years before coming to Paris. I have no relatives, or family homes, in any of the cities I lived in growing up, and I only have relatives in the San Francisco Bay Area by complete coincidence, since my cousin moved there a few years after me, and his parents recently joined him from the East Coast. My siblings don't live in the same city as my parents, and not even -- at any given point -- on the same coast, or continent. San Francisco is the place I've lived the longest and know the best. It's where I met my husband, had my children, bought our first house. So, I say I'm from San Francisco, but a "real, native" San Franciscan would certainly tell you otherwise. Meanwhile, the French people all have a place they are from -- usually in the countryside. It's a simple question, with a one-word -- or maximum one phrase -- answer. 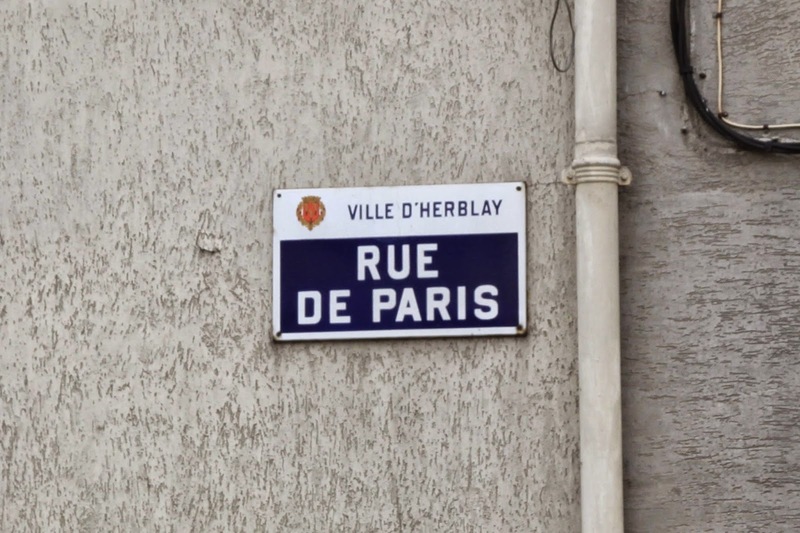 Even a born-and-bred Parisian whose family has lived many generations in Paris will still claim another, more remote, non-Paris hometown. Ask a French person where they're from, and it's easy: they grew up there, their parents probably still live there, and whether or not their parents live there, they probably have a family home there. My Parisian friends are from Auvergne, Montpellier, the Vendée, the Jura, Chamonix, and small towns throughout the country. Once, in class, the teacher asks kids who aren't 100% French to raise their hand: one friend of Pippa's, who is born and bred in Paris (as were her parents) and is a French citizen raised hers. Why? Because she's not French; she's Bretonne (from Bretagne), through one of her parents. She's also from the Dordogne, and spends virtually every school vacation and all summer there, with her grandparents. You can understand her confusion, but at least she's got a sense of hometown, somewhere. I realize there are some American families who all live in the same city and have more of a hometown sense than I do. But I know I'm not alone in my level of transplantation, either: of my best friends from high school, most live out of state (some out of country), and many of their families do, too. So when you ask me where I'm from, and I answer, "The U.S.," I'm not trying to be cagy. I'm just not French enough to have a good answer. The Briquette d'Auvergne is a raw goats' milk cheese from Cantal, in the region of Auvergne, in southern-central France. Cantal is more famous as the home of the cheese called Cantal, a sweet-nutty cows' cheese that's a forerunner to Cheddar. This is not to be confused with Brique d'Auvergne, despite the fact that both names mean a "Brick from Auvergne". 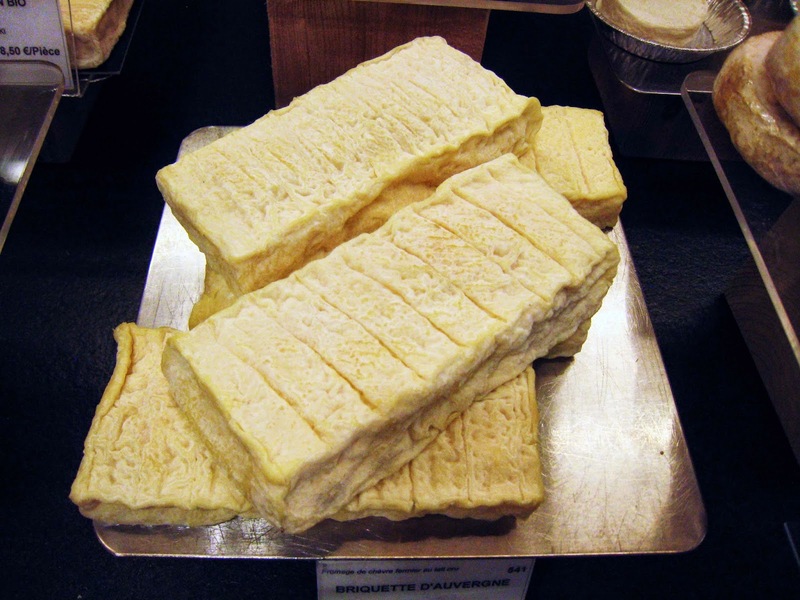 But the Brique d'Auvergne is a mixed cow-goat milk cheese. The Briquette d'Auvergne -- all goat, all the time -- is a goopy briquette, thick and thirst-inducing. It's got a wonderful balance of salt, farm-iness, sweet milk, and flowers. None of my Parisian friends are actually from Paris -- if you ask them -- many of them despite living her all their lives here and doing all their schooling here. One of my good friends, like this cheese, is d'Auvergne, "from Auvergne" in central southern France. Anytime we happen to be here over a break and want to get the kids together to play, it turns out they are going down to Auvergne to visit their grandparents and go "back" to their ancestral "home". If I were French, of course, I wouldn't put all those words in quotation marks. You may have read that France just passed the first step (lower house of the Parliament) for a law requiring a minimum BMI (Body Mass Index, specific number TBD) for models employed in the country from now on. Can a good deal be too good? It seems possible, as we travel around Europe, that some of these flights are so cheap, it makes you wonder... For example, I have just booked a plane from Budapest to Rome for about $35 on W!zz Airlines. I have this vague feeling I've been duped, and when I get to the airport with my W!zz e-ticket printouts, the desk agents will simply W!zz themselves laughing. In every city, there are plenty of places where you'd rather not spend much time. But there's always one you'd rather never, ever see: the inside of the children's emergency room. And yet, like most parents at one time or another, I find myself there with one of my children. Love is eternal. But so is death. So when somebody says "l'amour" (love) or "la mort" (death) is eternal, I'm not always sure which one we're talking about. My children tell me the last vowel in the words are different, and when spoken slowly and clearly, I can hear it. La-MORE vs. La-MOOR. If you ever encounter an English-language menu that offers the Daily Soup du Jour ("Daily Soup of the Day"), or the Soup du Jour of the Day ("Soup of the Day of the Day"), I just hope you can appreciate the redundancy and the humor. 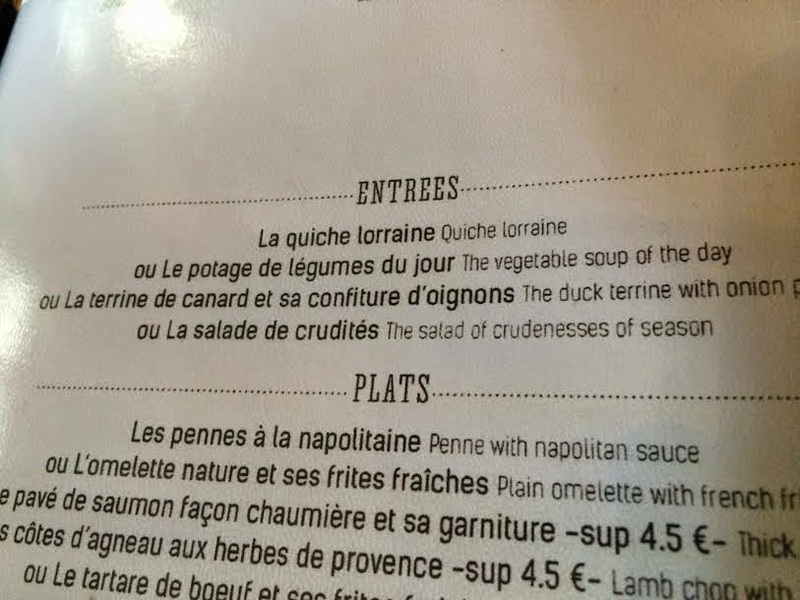 But if that doesn't float your boat, perhaps this French menu item, helpfully translated into English for the tourists, will amuse your bouche: "The salad of crudenesses of season." What you need to know about the menu -- which is "la carte" in French, is that you can order either à la carte (individual items off the menu) or you can order the menu. This does not mean you will be eating the paper for your dinner; the "menu" in French is the daily special du jour (yes, I did that on purpose), usually a 2 or 3-course option of entrée + plat, plat + dessert, or all three. Keep in mind, as you untangle the linguistic confusion that the "entrée" in French is what we in English call the "appetizer", and what we in English call the "entrée" is the "plat" in French. Since "entrée" means "entry" into the meal, I have to agree with the French logic on this one. And just remember when you do order your dessert not to order it à la mode, which doesn't mean "with ice cream" but rather "in fashion". Armed with all that, head off to your local French restaurant and bon appetit! Losange de Chèvre, which means "Diamond-Shaped Goat Cheese" is not, in fact, diamond shaped. Rather, it's hexagonal, or roughly flower shaped. At least, that's the shape of the Losange that I buy -- not to be confused with the cheese of the same name that is, actually, in the shape of a diamond. It's a beautiful, multi-toned, ashed goat cheese with a thick, wrinkly crust that looks just like the jowls of a Shar-Pei puppy. Luckily, it doesn't taste like a Shar-Pei puppy, but rather a lovely goat cheese -- thick, oozy, creamy, salty, herbal, and medium-strength. The cheese platter du jour which is a dessert course choice on the menu du jour at the fancy restaurant Anthony and I visit for our anniversary serves a Losange de Chèvre. If you look at the cheese board, it's the diamond-shaped one in the foreground, which makes perfect sense since the word "losange" means "diamond-shaped". So, there is a Losange de Chèvre on a platter du jour from the menu (or you could order the cheese board à la carte), but it's not the same Losange de Chèvre that I actually buy, bring home, photograph, and devour. So, just like there are two inconsistent meanings (French vs. English) for menu and entrée, there's also some discrepancy in just what a Losange de Chèvre is.